Ballintoy is a small, picturesquely sited village which occupies an enviable location near to the Giant’s Causeway World Heritage Site. The village is known for its old limestone harbour, once a hub of fishing activity, and beautiful whitewashed church, but is also home to one of the most intriguing and unique houses in the country, Bendhu. 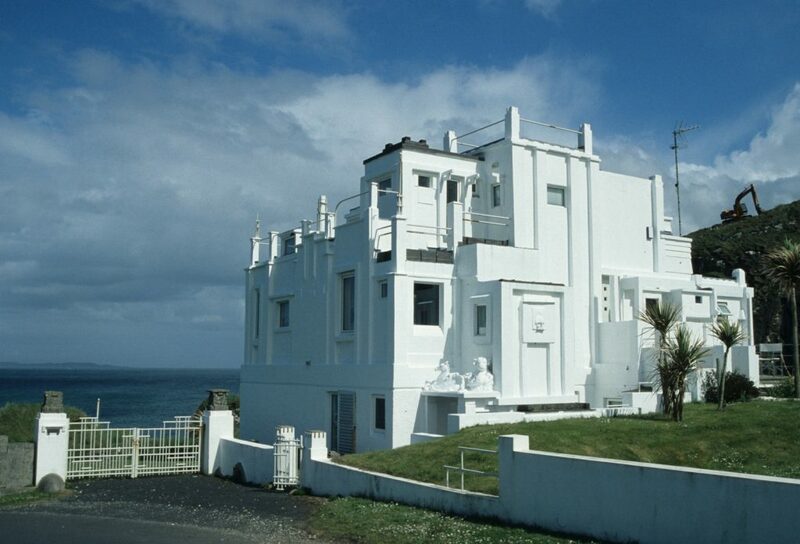 Bendhu takes its name from a nearby headland and was built over a 20 year period by the Cornishman Newton Penprase (starting in 1936 but later completed and extended by two subsequent owners), who had come to Northern Ireland at the age of 23 to teach at the Belfast College of Art. It was constructed in a most vernacular way; Penprase being both the original client and the builder, although concrete was the main building material rather than stone and lime. Its interiors are eccentric and entirely appropriate for such an unusual house. Brett considered it a “strange prickly silhouette and primitive-seeming structure of cubes, squares and rectangles”. It is fair to say that its architectural merits, particularly for such a dramatic and prominent location, have tended to divide opinions. The UAHS’s list of the early seventies in North Antrim, for example, referred to its “staggering eccentricity and inappropriateness”. However, in 1992 the house was listed Grade B1 by the Department of the Environment, who described it enthusiastically as “a uniquely sculpturesque product of a highly individual and creative artistic personality”. Bendhu has featured in numerous television programmes and many articles and is now the subject of a fascinating new UAHS publication, Bendhu and its builders, written by Andrew Cowser. Perhaps now this architectural and historic oddity will be more widely understood and appreciated.